Is it safe to reach out? That’s what people say when the topic of suicide comes up. They mostly mean well when they say these things. People trying to do something when they don’t know what else to do. For some of us who have been through hell and back with mental illness though, we know it’s not always safe to reach out. It’s not safe to call anyone. It’s not safe to talk about what’s really going on in our minds. When you have mental illness and you reach out, there are consequences. Reaching out can make things worse. Some people overreact – Friends/family may think that calling 911 to get you to a hospital or have a “welfare check” is a good idea. But getting the police involved in mental health crises is NEVER a good idea. Some people make it about themselves – In line with overreacting, many times people are so emotionally struck by even hearing of suicidal ideation that they make the issue about them and how it upsets them. This means that the person struggling can’t really express themselves worrying that they’ll just make their loved ones more upset. Some people invalidate – There’s a lot of invalidation in mental health already. When you express suicidal ideation it is ever more apparent. 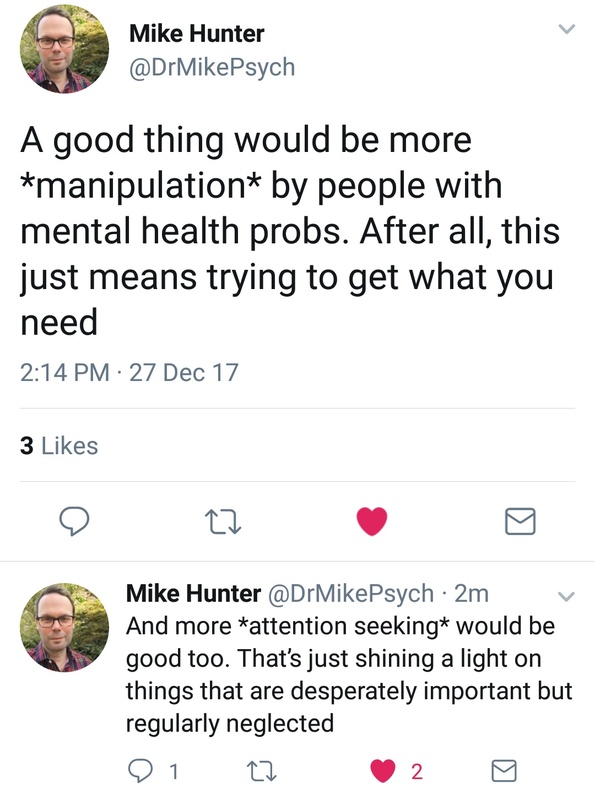 Families invalidate by saying it’s not that bad or to “get over it.” Hospitals and healthcare providers invalidate (I’ve heard terrible stories of people being turned away when they reached out for help). Invalidation creates psychological scars. Sometimes it lands you in the hospital – As part of an overreaction, and just like calling the police, taking someone who says the feel suicidal to a hospital is NOT the answer. ERs and psych wards are not helpful and often result in more trauma. The situation can be made much worse. The person suffering can be subjected to cruelties you can’t imagine including verbal, physical, and sexual abuse. This is not an overstatement or hyperbole. And usually the harm and ramifications are even greater for those in marginalized communities including people with disabilities, people of color, those with certain stigmatized mental health illnesses (Borderline Personality Disorder, in particular), LGBTQIA individuals, and those without close support systems that will visit them every single day. Hospitals are NOT safe places for the mentally ill. I urge you to do whatever you can to keep yourself or a loved one away from them. And if your loved one is in a hospital, do everything to get them out as soon as possible. Psychiatric hospitalizations might actually increase suicide. Hospitalization is of unproven value for suicide prevention and can often produce negative effects. Patients are unlikely to recover as the result of an admission, a stay in the hospital can often be little more than a suicide watch. Although the term “safety” is often used to justify inpatient treatment, we do not know whether patients are actually more safe in the hospital. Long-term admission is no longer practical and in any case has never been shown to be effective for patients. The hospital environment in an acute ward is hardly ideal for taking new directions in therapy. So while people encourage others to “reach out,” some of us know that it’s not safe to. We know we could face at best some invalidation but more often we are met with stigma, overreaction, people making it about themselves, and more. But at worse, reaching out means risking police involvement and/or being locked up in a psych ward – consequences which are too great to risk. If you want people to “reach out” then you have to be willing to be there for them. Otherwise, you’re doubling down on the reasons it’s not safe to reach out. For those who are worried they will end up in a hospital, I highly recommend you fill out a Declaration for Mental Health Treatment. You can find an example on the Texas Health and Human Services website here. This is not a document I’ve seen in other states and the enforcement of this document may not be upheld everywhere but it is at least a statement of your preferences for medication, convulsive therapy or other treatments, and emergency mental health treatment to be used if you are deemed incapacitated to make treatment decisions. While you can’t protect yourself fully from the trauma and abuse of hospitalization, this may help a little. Linehan, M. (2011). BPD Expert Dr. Marsha Linehan at the National Institute of Mental Health. Large, M. M. and Kapur, N. (2018). Psychiatric Hospitalisation and the Risk of Suicide. The British Journal of Psychiatry, 212, 269-273. doi: 10.1192/bjp.2018.22. Paris, J. (2004). Is Hospitalization Useful for Suicidal Patients with Borderline Personality Disorder? Journal of Personality Disorders,18(3), 240-247. doi:10.1521/pedi.18.3.240.35443. Found at: http://ectweb.pbworks.com/f/JPersonality disorder.pdf. This entry was posted on Friday, June 8th, 2018 at 8:15 pm and is filed under Advocacy, Mental Health, Patients. You can follow any responses to this entry through the RSS 2.0 feed. You can leave a response, or trackback from your own site.